I’m of a mind that the best moments of any voyage are serendipitous, often costing little or nothing if you are ready to receive them. So when I managed to huff and puff my way to the top of the Bruton Dovecote in Somerset and came face to face with a small grazing herd of the most splendid dairy cows on this green earth, I stopped and plopped down. 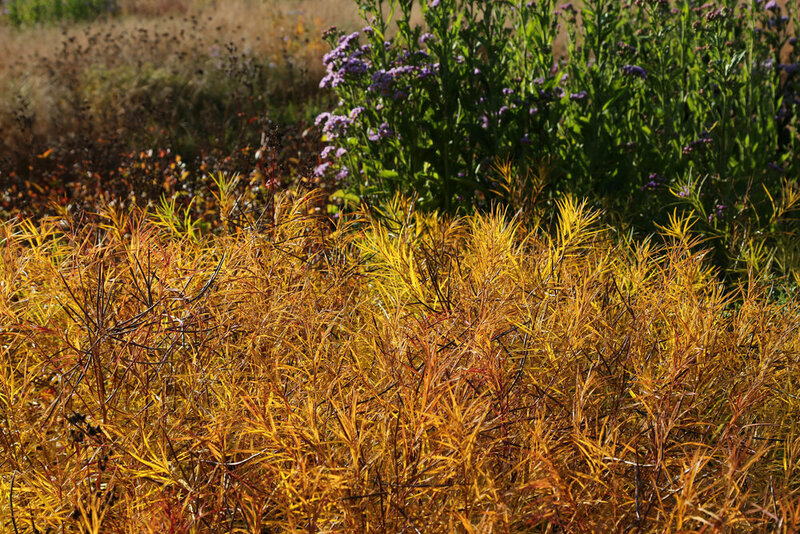 We were on the way to Hauser & Wirth to see Piet Oudolf’s gardens in their late autumn splendor after a gratifying lunch At the Chapel. I was full up. All I wanted to do was sit. 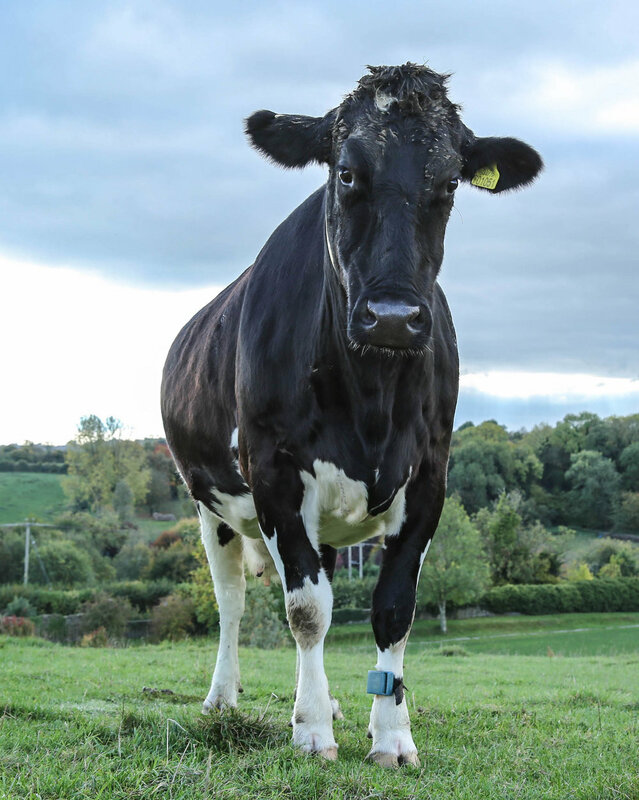 Cows are thought to be dumb, insensate creatures, but that is not my experience of them. One in particular took an interest, and in the ensuing, doleful yet intense staring contest, she clearly asked the most pertinent question of the day, and in fact the journey : what are you doing here? This is the question it’s wise to start with every day when you travel, but one you rarely hear from the people you are interacting with - purveyors of hospitality - whose job it is to please, not to challenge. Just through the romantic veil of travel you can glimpse the financial exchange that’s going on, alongside the cultural one. You want adventure, great food, lots of drink, a room with a view! They want you to support them, will thank you for your temporary adoration as you’re heading out the door, see you again, bye! In London over a noisy dinner when I could not stop going on about the trees! The trees in England! My friend asked “you live in a forest…but you come here to see…trees?” Yes, in fact I do, they have trees to beat the band in England, but also, mostly, to try and see the forest for the trees, which is not always possible when you are well stuck in, juggling day to day, just trying to keep all the balls in the air. Back of House, Front of House, purveyors, managing the farm. When a guest finally goes out the door at the end of a long day it would be wonderful not to worry about the popularity contest social media has become and just trust you’ve had a delicious, worthwhile exchange with them. The impetus behind publishing these personal images, places where we did have meaningful experiences, is to celebrate them in hopes you will seek them out. Hats tipped for the talent and dedication that make them work. And to leave you with this thought: while it often costs a great deal of money to create restaurants and hotels which are both sustainable and stunningly beautiful, it may not be inevitable that the joys of great food, drink and hospitality will be increasingly unaffordable to many, even given the economic disparity that’s growing in almost every sector of our country. Not if we support any enterprise that’s advancing the change we hope to see in the way animals are reared and crops are produced. Not if we really care where our food comes from. We aim to Eat the View everywhere when we travel, and boy did we feast in England. In terms of creative, divine madness, where the talent was still at the stove (increasingly rare) the meal we had at David Toutain in Paris exceeded anything else we have eaten this year, but the food that inspired us the most was directly connected to a ‘view,’ i.e. the beautiful thriving gardens directly outside the windows where we dined. 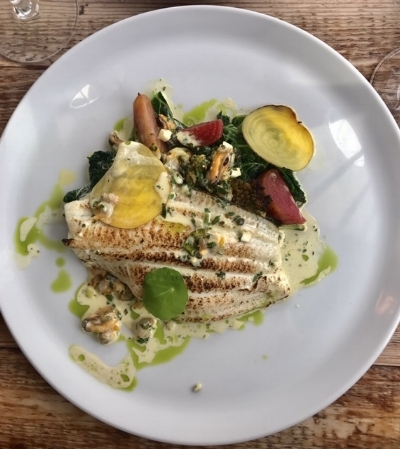 The Ethicurean, in the Barley Wood Walled Gardens of Wrington, and the two meals (and breakfast) we enjoyed at The Wild Rabbit, in Morton-on-Marsh, topped an estimable list. These two experiences span the distance between what sweat equity and fabulous fortune (which can afford the sweat of others) may engender, but both deliver and delight in meaningful ways, confirming that when your goal is a commitment to Farm to Table you can accomplish remarkable things that can affect people’s lives. Ethicurean could do no wrong, they had us at hello. 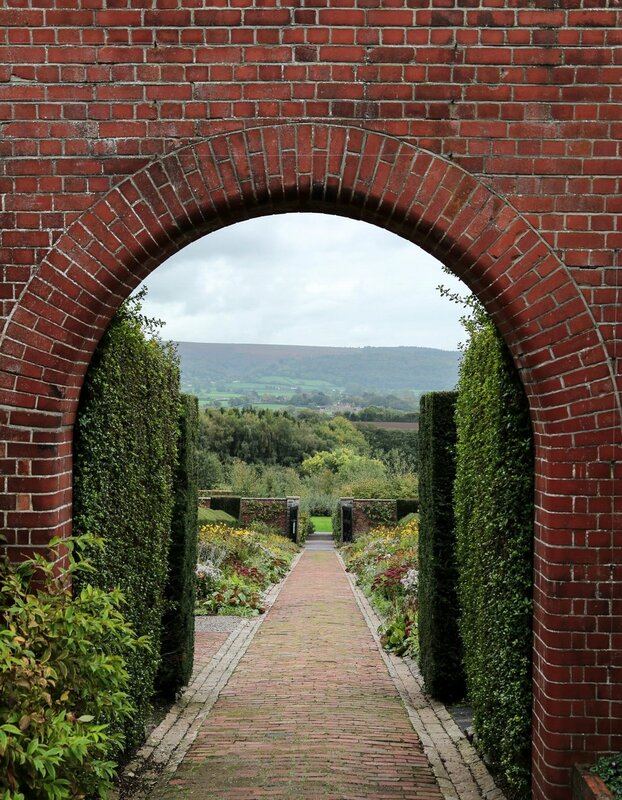 I urge anyone traveling to this little corner of the world just outside Bristol to dine, leaving a few hours to wander through the extraordinary walled gardens. The history is fascinating: four friends who took over a dilapidated, centuries old garden estate and brought it back to life and into the heart of their rural community. Some of the vines and trees in the orchards were planted in 1901, the year Queen Victoria took her final breath; all of it is vibrating with health today, reflected in the simply delicious food they serve. Can’t visit? Ethicurean has published a brilliant cookbook you can order online. 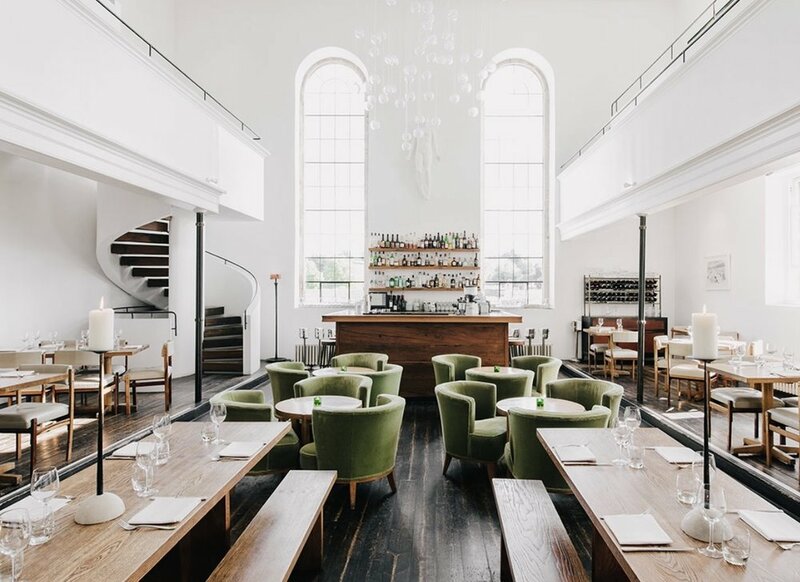 The Wild Rabbit in the heart of the Cotswolds manages to be a ‘local’ pub and a lovely fine dining restaurant, with thoughtfully designed rooms up a narrow winding stair. That a 20 minute walk down a (usually) muddy lane takes you through Daylesford Farm, a wonderland of gorgeous grazing fields and impressive greenhouses, would have been enough. That at the end of your walk you find a stunning Eataly style two story mega food emporium featuring vegetables, cheese, dairy, bread, flowers, all produced in the surrounding farmlands, owned by a single family, sold by an engaging informed staff, is beyond impressive. It is the jewel in the crown of the Daylesford brand which has been producing and delivering farm to shop food products across select London businesses for two decades. Several classes could be seen through the glass walls of the cheese room, the large cafe had been buzzing with punters of all ages, and several private parties were in full swing. This may not your local super, admittedly this is a posh part of the English countryside, but it’s a commendable achievement that does not skirt the fact that the price of great food, especially proteins ethically raised and produced, is expensive. If we learn to eat less at the top of the food chain, live seasonally, shop for the locally produced, and for god’s sake learn to cook, we may see that price inch down. Belmond Le Manoir aux Quat'Saisons, Great Milton, Oxford. 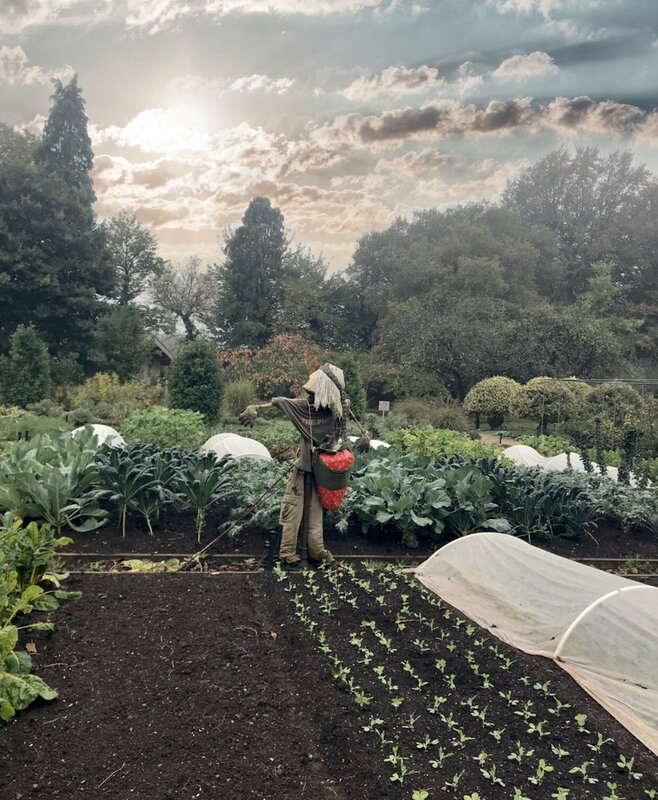 Both Belmond Manoir aux Quat’Saison, with it’s beautifully productive gardens studded with sculpture, glass and neoprene greenhouses, and the Pig Hotel near Bath, which like the other Pig Hotels spread across the most bucolic parts of England have remarkable edible gardens, base their menus on what comes from their view. 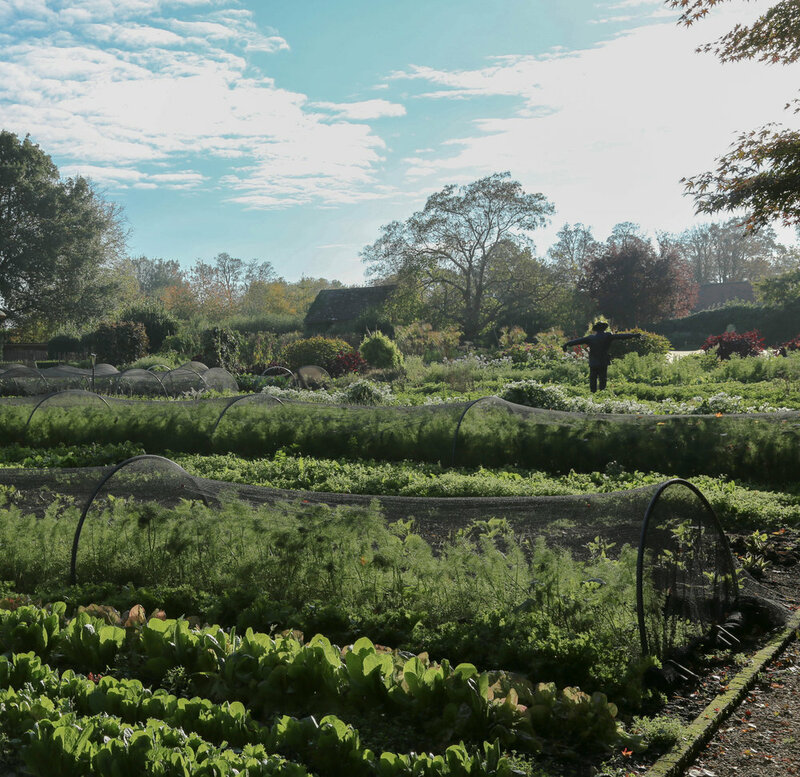 In the Pig’s case the rule of thumb is that everything served which they cannot grow is sourced from sustainable purveyors within a 25 mile radius of each hotel. While we thoroughly enjoyed our time with James Nobel, farm manager at the newly opened Heckfield Place, it’s impossible to tell what their ambitious but nascent on site food programs of new orchards, multiple greenhouses, chickens, pigs, and sheep, will develop into over the next few years. It takes more than money to produce food the quality Ethicurean, Wild Rabbit and The Pigs. Dedication and education of a work force, engendering their love for what they are doing, is essential. Beyond that, but rarely found, is a connection to the politics of the greater food community even if unbeknownst to the guest. Which is why At The Chapel won our hearts. 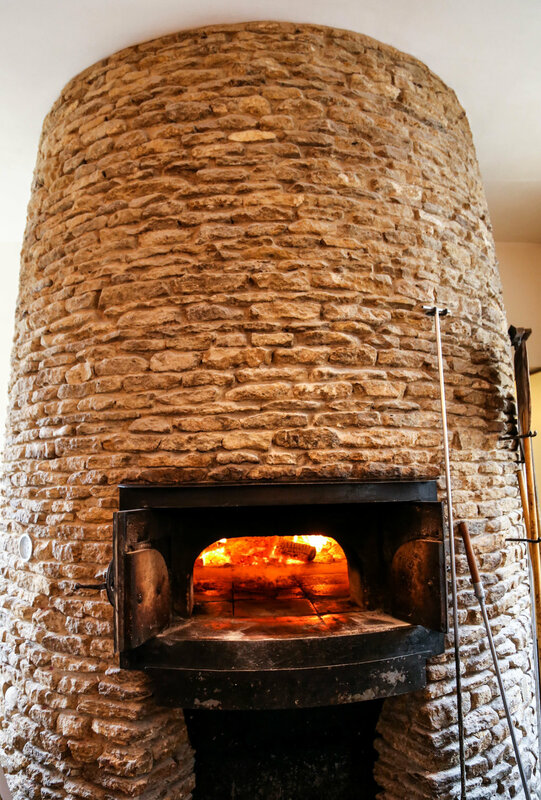 They manage, with impressive alacrity, to combine great food and challenging social forums. Follow their newsletter, better yet stay there if you travel to Bruton. 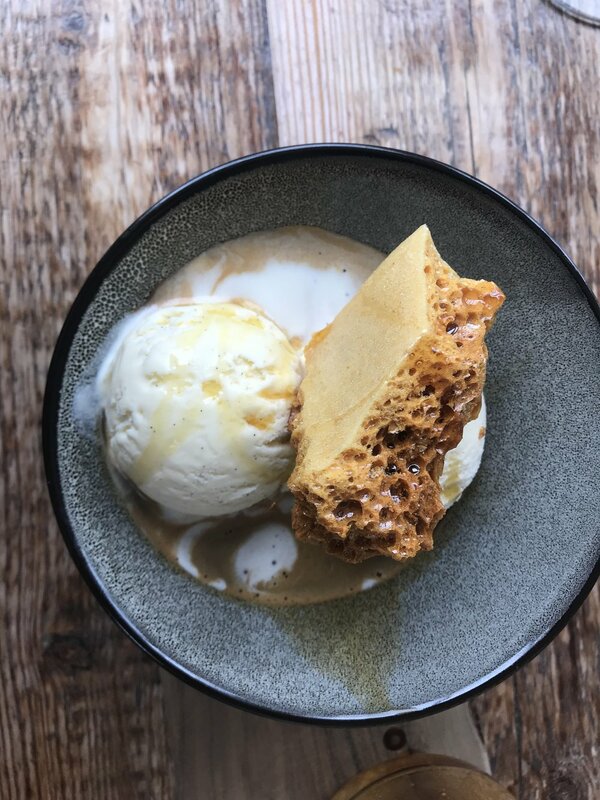 The food is great, you are a few minutes away from Hauser & Wirth and Piet Oudolf’s Garden, and with any luck you can make a detour and spend time with the cows on the Bruton Dovecote. 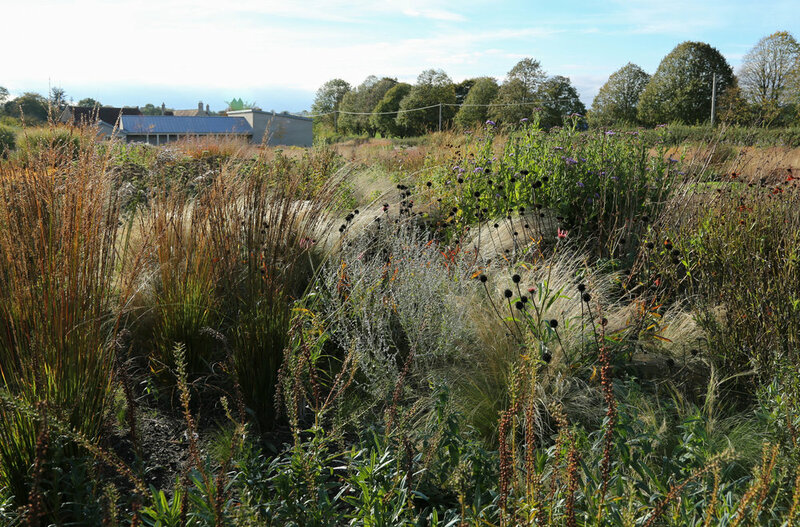 The ‘five seasons’ gardens of Piet Oudolf at Hauser & Wirth, Somerset, (above) are only a 20 minute ride from At the Chapel, in Bruton and the Pig Hotel, Bath. Barndiva is branching out from Apple Juice, Vinegar and Balsamic: we now have 50 gallons in copper stills that with the help from our friend Tara Jasper of Sipsong Spirits we hope to make our first ever apple brandy. Tasting the best of what Somerset and Devon had to offer with respect to anything apple was high on our list this fall. The Pig Hotels, which all have exemplary bar programs, did not disappoint. This was our first stay at their hotel near Bath (the Pig at Comb is a perennial favorite) and their engaging bar staff there, with Max at the ready, took us through all the local ciders, introduced us to the rising Non-Alcoholic Seedlip brand (which we hope to serve soon at Barndiva) and introduced us to the most extraordinary apple aperitif - Kingston Black - a Somerset Cider Brandy. Roaring fire, hundreds of white deer crossing the fields outside the windows, dusk falling over the gardens made for two memorable evenings. Dinner was a whole roasted chicken sourced just from down the road, a load of fries, a garden salad and a surprisingly great Pinot from Wairarapa, New Zealand. Most of the wines we drank throughout the trip were French, as it turns out. At BRAT, a fish restaurant in London, they have a constantly changing Coravin program; at Lyles, also in London, it’s Pet Nat and other ‘raw’ unfiltered finds which may not be to every taste but challenge our notion of what we should be pairing. The best Somms listen before steering you in any direction. Chappie Cottrell, who has taken over Barndiva’s wine program, thankfully shares this skill. Stay tuned for lots more about Chappie in the coming months. 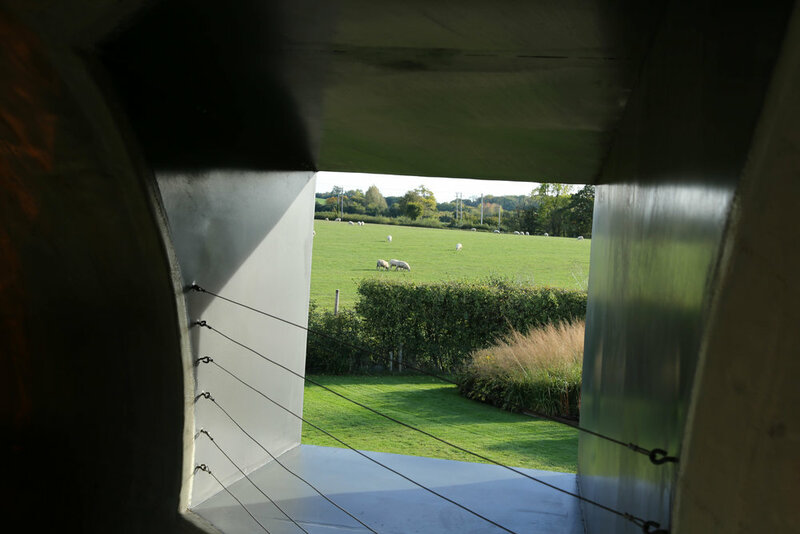 Richard Long’s “Madrid Line North, 1985” in the lawn of Hauser & Wirth’s Durslade Farm, Somerset. Jean-Michel Basquiat and Egon Schiele powerhouse double exhibit at the Fondation Louis Vuitton, Paris. Two angry men, with surprisingly at lot in common. Extremely relevant. The adjustment upon re-entry from any trip can be (usually is) temporary - a mild re-direction in attitude from being reminded it’s a big world out there, which you are certainly not the center of. But it can also be large and resonate- encouraging you to rediscover an appetite for incorporating life with work in the ways they interact, support each other. Enjoy all those travel Instagram accounts, I know I do. At the airport I picked up Cereal, a life style travel and design magazine published in England by one Rosa Park whom, as chance would have it, I have been following on Instagram...wish fulfillment on a beautiful level. Just remember to put down your recording device before you pick it up again. Travel alone cannot change anything about the way you see the world unless you immerse yourself in the culture with an open mind, and crucially, an open heart.